Kayaking on a warm sunny day can be quite enjoyable when you’re floating on the water. But when it starts getting hot and the sun is directly in your face it can ruin your experience; it can get too hot or you may get more sunburnt than anticipated. Fortunately for you, there are canopies you can attach to your kayak to give you a bit of shade. If you have a kayak and you’re looking for the best canopies on the market to give you some protection from the harsh sun, you’ve come to the right place. We’ll give you all the information you need to know before purchasing your kayak canopy. Why Would You Want to Get a Canopy for Your Kayak? As mentioned before, kayak canopies provide shade from the sun, but it’s not only for comfort. It’s also for your protection as UV (ultraviolet radiation) can cause skin cancer. While sunblock can prevent sunburn to a certain extent, it’s advisable that you always stay shaded if you’re spending long hours in the sun. The weather can be unpredictable as one moment it will be sunny and then the next there may be thunder clouds forming overhead. Kayak canopies provide shelter when it rains but it’s advisable that you make your way back to shore as kayaking in stormy weathers can be dangerous. While you’re making your way back to land, the kayak canopy ensures you don’t get soaked in the rain. Some people love the heat and basking in the sun is like heaven to them, but if you’re the type of person that prefers to stay cool then you’ll need shade. Kayak canopies keep you cool on those hot days as it shades you from the hot sun rays. Lixada manufactures its kayak canopies using ripstop fabric to ensure durability and water resistance. The rods are made from aluminum which is light and won't weigh down your vessel. The canopy covers up to 8ft² of the surface area providing you with full body coverage. 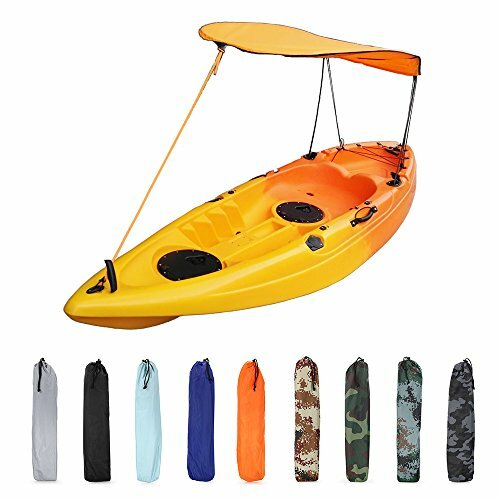 The Lixada kayak canopy is easy to install and store as it folds up & can be placed in the bag it came with. They also come in a wide variety of colors such as orange, light blue, black and grey. If you want a versatile kayak canopy the Adventure Sun Shade is for you as the design can adapt to any kayak size. This canopy comes in at 54" to provide a sufficient amount of shade for your entire vessel. You can also adjust the canopy’s height from 9ft to 11ft which is ideal for vessels that have different types of cockpits. The poles are made from fiberglass for stability and it doesn’t add any extra weight to your kayak. For a quick and easy setup the poles have integrated shock cords. 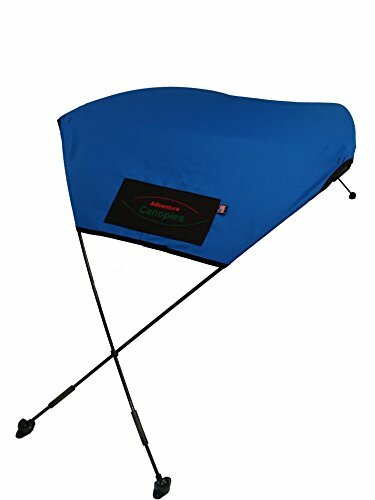 Adventure Canopies are compact and can be stored in the carry bags they come with. The WindPaddle sun shade is a flexible canopy that can withstand winds of up to 10mph. It connects to your boat using lines, loops, eye pads and other hardware integrated onto your kayak. You can also use the cleats that come with the product to mount the canopy. WindPaddle’s product provides up to 8ft² of shade and weighs a mere 2.5lb. It’s water resistant making it practical for rainy days, and it’s durable & won't tarnish in the sun. The New Vortex provides shade for 20" to 30" wide. This canopy’s shade is made from high-quality materials such as 600D polyester canvas and nylon fittings. The color is a bright white for visibility and it doesn’t absorb heat. The Vortex cover shade is extremely sturdy as it comes with integrated poles made from aluminum tubing. The poles are weather resistant and won’t rust after coming into contact with water. They’re also incredibly sturdy and won't easily bend or break in the wind. 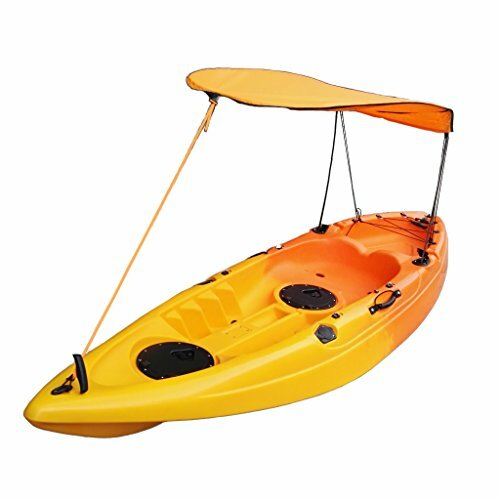 MonkeyJack Universal kayak canopies come in a bright orange color for easy visibility. The fabric is made from polyester to ensure durability and weather resistance. 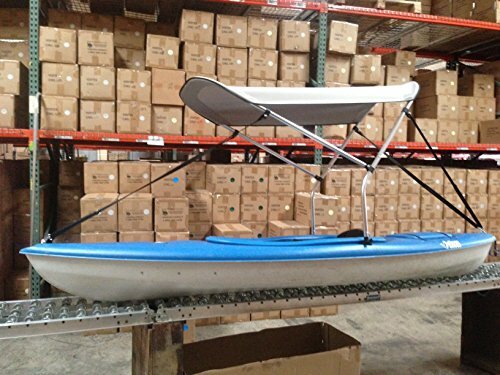 It comes in a 50.8" x 24.6" size for maximum coverage of any standard kayak size. The folding rods are approximately 85mm in width and 3.3" in length. They’re made from aluminum for sturdiness and durability. MonkeyJack’s Kayak canopy is easy to mount and to dismount & it comes with all the tools you need for a quick setup. Make a note of your kayak’s dimensions before purchasing a canopy so that it fits well over your vessel. Unfortunately, there aren’t many size options but most canopies are versatile and can be fitted onto any standard size kayak. Make sure the product you purchase covers the areas you need. A kayak canopy should be able to cover the entire cockpit so it can provide shade for your entire body. Canopies are usually shaped in such a way that they can cover the entire area of a kayak. Most kayaks are made from canvas, polyester or nylon which are known to be strong and durable materials. Canvas is the stronger fabric compared to nylon and polyester as it’s more weather resistant, more breathable & doesn’t absorb heat. On the other hand, nylon and polyester may not be as durable but they’re more affordable, light in weight & provide better rain shelters as they’re waterproof materials. The materials used to manufacture canopy frames are also important to consider as this affects your kayak’s stability. Kayak canopy frames are usually made from steel, aluminum and fiberglass. Steel frames aren’t very common as they’re quite heavy. Aluminum and fiberglass are much better selections as they won’t bend or break. The frames made out of aluminum and fiberglass are also weather resistant so they won’t rust after coming into contact with water. The materials used to manufacture kayak canopies play an important factor when it comes to weight. If you select a canopy made from canvas and steel, this could put a significant amount of weight onto your kayak which is not ideal. It can throw your vessel off balance. Polyester and nylon fabrics with a light frame made from fiberglassor aluminum are advisable as they’re light in weight & won’t cause your kayak to tip over. Installing a kayak canopy shouldn’t be difficult at all, and most products don’t require any tools to mount them, but this all depends on what you buy. Some canopies require you to drill holes into your kayak to install them. If you’re not keen on the drilling method, you could always opt for products that can be strapped on to your kayak. Furthermore, for practicality you should select a canopy that comes with all the tools needed for installation. An additional advantage is purchasing a canopy that has integrated shock cords in the poles as this makes setup faster. 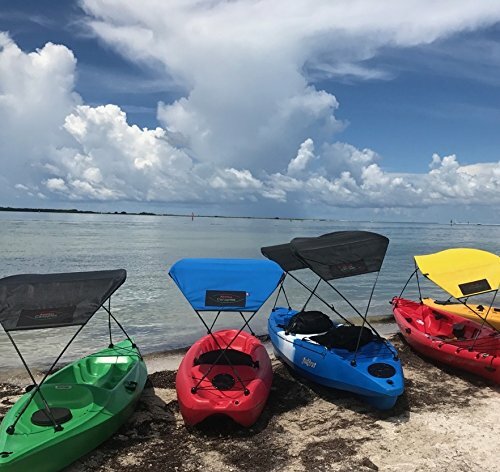 Installing a canopy can add some bulk onto your vessel, so you may want to opt for a product that can be removed easily when you need to store your kayak. All kayak canopies are portable, compact and light enough to carry so if you need to transport the product somewhere, this will be easy. Now that you know what features to look for when purchasing a kayak canopy let’s take a look at the top five products on the market. Getting out of the house and doing something different like kayaking is a fun way to spend your leisure time. Now simply make sure you’re protected against the harsh elements of the sun. 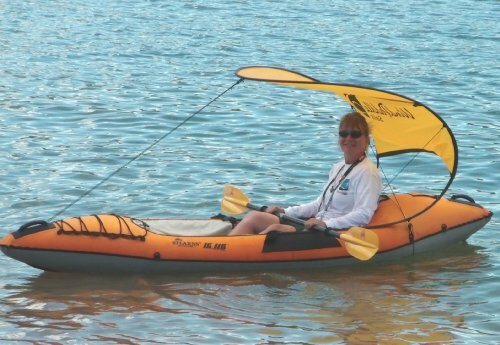 Be comfortable and safe on all your water adventures & get your very own kayak canopy. You’ll be able to relax the whole day in a cool protective shady spot while you fish or read a book on the water. That’s the life!